Macbook Pro Retina LCD replacement. One of the Mac repair many Mac owners would not want to do. Such a replacement may be needed due to a cracked LCD caused usually by accidental drops. The repair is expensive. What is worse still is that there are varying prices and options presented by different Mac repairers. Repairs can range from $400 to $1000, depending on the quality of the LCD, the skills of the technician replacing your screen, whether you get the LCD replacement from independent repairers or with Apple Authorised Service Providers, and whether the LCD is an an OEM part, or original Apple part. In this article, we will show you the different kinds of LCD replacements available and how to decide which kind to go for if your Macbook Pro Retina LCD is spoilt. Let us first understand the construction of a Macbook Pro Retina LCD assembly. These kinds of LCD assembly are used in the Macbook Pro Retina 13″ and 15″ from 2012 – 2016, as well as the Macbook 12″ with Retina display. In a situation where the LCD is not badly cracked, an OEM inner LCD replacement can be done. In this kind of repair, only the outer LCD panel is changed. The cracked LCD panel heated and loosened from the strong LCD sticky tape that adheres the LCD panel to the aluminium cover. A replacement LCD is then glued and assembled back. No matter what your repair shop says, such repairs will always use OEM LCD screens manufactured by third parties. Some of these third parties may be companies manufacturing for Apple, but they are strictly considered non-original, though the resolution is the same as the original and the colour reproduction is quite similar. Such a repair requires an experienced technician with fine micro-motor skills, as any puncture of the backlight by the cracked glass shards of the LCD might result in imperfections to the finished replacement. Any puncture of the backlight will be exhibited as white light streaks when the LCD is turned on. These kind of LCD assembly replacements comes with an OEM LCD panel pre-assembled onto the aluminium covers. The covers are usually sourced from Macs with spoilt LCD panels. The LCD panels are removed from the old Macbook Po Retina LCD assemblies, and are replaced with new OEM LCDs. It is suitable for customers who want to have new aluminium covers as their Mac has very badly dented and unsightly aluminium covers, or that their Macs have very badly cracked or shattered LCDs. The prices are higher than OEM inner LCD replacements, and depending on where the repairer sources their parts from, such parts also might suffer the same issues as inner LCD replacements, namely colour and brightness variation as well as light leak issues. We have observed that some of these LCDs have light leak from the Facetime cameras, resulting in purple tinges in the photos or videos being taken with the Facetime cameras. Some unethical repair shops pose off such reassembled LCD assemblies as original Apple LCD assemblies to earn higher margins. These are the best type of replacements. Original Apple LCD assembly replacements are new, untampered with, and has the exact colour gamut , brightness and resolution of the Retina LCDs that comes with Macbook Pro Retina that are sold in Apple stores. These assemblies are from Apple’s factories and have protective films on the front and back of the LCD assembly. Notice that such assemblies comes with serial numbers, barcodes, quality control stickers (Gamma PASS), and protective plastic coverings for the LCD cable. They also come with new rubber pads that adheres to the inner LCD hinge. There are also some original Macbook Pro Retina LCD assemblies that do not come with such stickers. LCD assemblies that do not come with serial number stickers might also be original Apple parts, except that they are procured from different sources which we are not at liberty to reveal. So how do can we tell if the LCD panel replaced by a Mac repairer is original or not? There are 3 ways you can tell if the LCD assembly a shop offers you is original. The price, whether there are serial number stickers and protective plastic caps for the LCD and WiFi cables, the brightness adjustment and automatic brightness sensors. Price is not the most accurate indicator, but a low price definitely means the LCD replacement is a re-assembled part, even if they replace the entire aluminium cover. Original Macbook Pro Retina 13-inch assemblies typically costs $660 – $750. Original Macbook Pro Retina 15-inch LCD assemblies typically ranges from $750 – $850. Shops that do replacements at $750 for a 13-inch and $850 for a 15-inch might be a ripoff, but any repair shop that offers an original brand new Apple Macbook Pro 13-inch LCD assembly at a price lower than $660 might be replacing a re-assembled OEM LCD assembly. The cover is probably not brand new but looks as good as new, and the inner LCD itself is an OEM part. That said, Apple Authorised Service Providers do replacements at around $1,000, so any shop that offers a lower price would already be a good deal in a sense. Original Apple Retina LCD assemblies may not come with such labels and plastic caps, but those that do have them, especially when all the mentioned parts are present, are most likely original. The brightness of OEM LCDs tend to be brighter than the original LCDs even at the lowest brightness setting. Brightness adjustments of original LCDs are very minute whereas for OEM LCDs, the brightness will suddenly change from very visible to totally dark, when the brightness is at the lowest visible setting. OEM LCDs may also not adjust the brightness of the LCD quickly even when the automatic brightness setting is set in the System Preferences>Displays>Automatically adjust brightness. One way to test whether a screen is original or not would be to cover the entire Facetime camera with your hand. The brightness of Original Apple LCDs will swiftly dim once the sensor right beside the Facetime camera is covered up. We know of repair shops who do not tell their customers the LCDs they are replacing are OEM parts. In fact some shops only have OEM LCD inner replacement services or OEM LCD assemblies. Do be careful when choosing a LCD replacement for your Macbook Pro Retina. Of course, we unabashedly will recommend you give us a try if you have a Macbook that needs a screen replacement. We discovered evidence of Apple Authorised Service Providers using water damaged boards in Apple refurbished devices sometime back. We withheld from publishing our findings sooner. We were not sure if the board that was replaced on our customer’s Mac was repaired and supplied by the Apple Authorised Service Provider in Singapore or it is a company practice adopted by Apple in general. It appears that it is a company practice that Apple adopts for devices sent in for repairs and refurbished products that may be put on sale. We discovered this issue after a NUS student sent in her Macbook Pro Retina 2014 to us. After our diagnosis, we determined that it may be due to a video issue. We advised her to pursue the issue with Apple Singapore to see if they could escalate her issue to the Mac specialist for a free replacement. Her Mac was just out of warranty for about a few months and there were other users with Macbook Pro 15″ with similar video issues. She managed to secure a free logicboard replacement, which to her dismay, failed again after 6 months. She brought her Macbook to us for a diagnosis again after having a bad experience with the Apple Authorised Service Provider. We were appalled to see water stains – signs of water damage on the board. Apple eventually refused to replace the board as her Mac was repaired for free and does there is no extended warranty. This issue has been confirmed by Dr Jessa Bethany Jones. She has relationships with people from the famous iFixit company and is a trusted repairer in the independent repair community. Her video detailing what she discovered is shown below. We feel the need to blog about this as the general public feel that only Apple is ‘qualified’ to repair Apple products. Besides introducing proprietary pentalobe screws to prevent casual users from opening up their iPhones, Apple even tried to prevent independent home button replacements from being performed by locking down iPhones. Their reasoning is that paying a premium for repairs done by them will ensure that the parts that are replaced will be brand new original parts. This signals to people the impression that that replacements done at Apple will be superior to those repaired at your local quality independent repair shop. As shown in our findings and the video, this might not always be true. Independent repair shops can be more professional than Apple Authorised Service Providers. Consumers deserve the right to know what they are getting. Unfortunately the right to repair bill has failed in New York, so premiums for repairs done at Apple is here to stay. In the meantime, do contact us for quality reliable Mac repair needs. We are able to perform component level repairs so that expensive logicboard replacements are not necessary in most cases. We will never replace your logicboard with a water damaged board that has been repaired. Replacement logicboards from us are either brand new or used but have not been repaired in any way. Recently, we have replaced a few Macbook speakers for some customers. The speakers were spoilt due to wear and tear. To avoid Macbook speakers replacement, the best option is to use external desktop speakers for your audio enjoyment. Macbook speakers have smaller domes, which are susceptible to wear and tear. Besides producing better sound, good desktop Macbook speakers also can last for possibly a decade. The Altec Lansing speakers we had lasted for 10 years before it spoilt. A good pair of speakers that many raved about are the Audioengine A2s. A revised version with a built-in DAC, the A2+ are now being sold instead. The speakers are mid-range multimedia speakers that cross into the audiophile grade. They are encased in glossed MDF wood cabinets, unlike ordinary plastic speakers. They also come with Kevlar woofers and silk-dome tweeters. The RCA and Mini-Jack inputs are gold-plated. 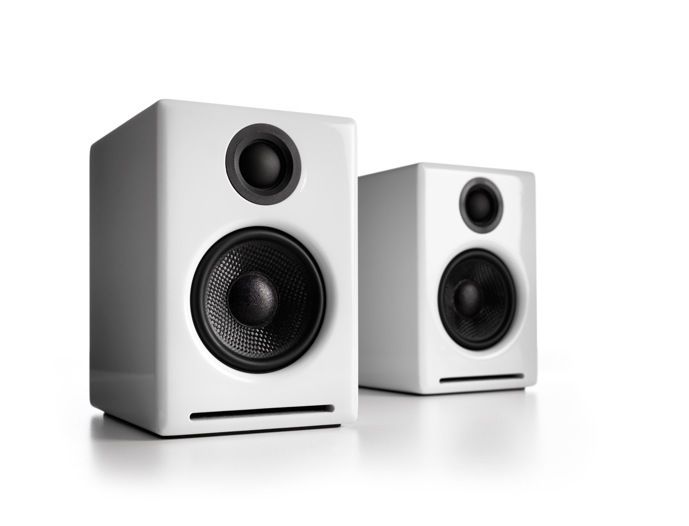 They need a recommended 100 hours of burn-in to sound well, and you need to tweak the setup, such as spacing them equally apart, raising the height to your ear-level, or titling them upwards with speaker stands. They are available in Gloss White or Black. Comes with 3 years 1-1 exchange warranty. Google for reviews. See audioengineusa.com for more information. They are available at Horizon Acoustics at Upper Bukit Timah Road Beauty World Centre and Decibel at Sim Lim Square stock them. Google for their contact details. Blog post by a pleasant lady customer detailing her experience with Mac Plus. Thank you for your appraisal! There are not many reviews of Mac repair services in Singapore. We are therefore pleasantly surprised by a blog post written by an nice lady praising and detailing her experience with repairing her Macbook Air trackpad with us. She is a foreigner working in Singapore and was concerned about finding a reliable Mac repair service as well as finding her way to the place. She decided to choose Mac Plus as her service provider due to the friendly response she got from us which set her mind at ease about us being a rip-off. Well, before we started our business, we too were concerned about being conned by repair shops so we can understand customers’ concerns. We are glad she find us helpful enough to post a review on her blog. As a small startup we are thankful her support and to every customer that walks through our door. Some customers have asked why do I say us when the only technician they see is me, as if it is a one-man-show-operation. Well, that’s because our partners have not come into the picture, or shown their faces, yet. We are thankful that foreigners who aren’t sure of their way gets helped. It can be a harrowing experience to find a reliable Mac repair service. Her post is written in March 2015. We are posting the link here since our page has moved to her new location. http://www.macplus.sg/wp-content/uploads/2016/04/macplusweblogo.jpg 0 0 just1ed http://www.macplus.sg/wp-content/uploads/2016/04/macplusweblogo.jpg just1ed2016-06-08 00:58:582016-06-15 03:22:36Blog post by a pleasant lady customer detailing her experience with Mac Plus. Thank you for your appraisal! For those wanting to speed up your Macs, Solid-State Drive upgrades for Macs to replace your traditional hard disk can be one of the best upgrade you can ever do. Macs are notoriously reliable if you take good care of them. However, not all SSDs are provide the fastest performance for certain Macbook, Macbook Pro, and iMac particularly those with Nvidia MCP79 chipset. If you decide to install a SSD by yourself and choose the wrong drive, you could end up only achieving half the data transfer speed your Mac is designed for. 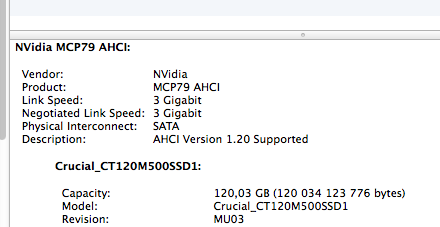 You can check which chipset your Mac has by going to About This Mac>System Report>SATA/SATA Express. When you have one of these Macs and you install a Solid-State Drive (SSD) with a Sandforce chipset, you might face an issues where your transfer speed decreases be half as the chipset and the drive you have is incompatible. 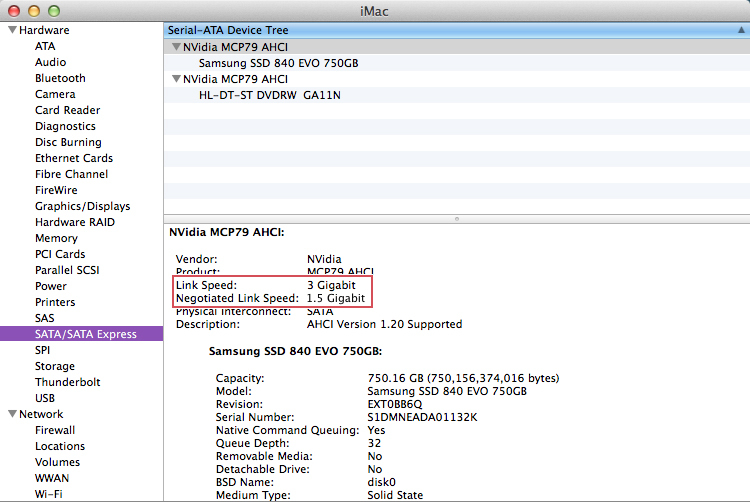 The Mac will show a negotiated link speed of either 1.5 Gigabit if your Link Speed is 3 Gigabit (SATA 2) or 3 Gigabit if your Link Speed is 6 Gigabit (SATA 3). Macs before 2011 uses SATA 1 or 2, and later Macs uses SATA 3, which is faster. The Samsung 840 Evo has issues as well. It uses a MEX controller. If you have one of those Macs, the most compatible product is Crucial. The older BX100 uses a Marvell controller. The current BX200 uses a Silicon Motion controller. We have installed a lot of Crucial users without issues. The newer Samsung 850 Evo and newest Evo 750do do not appear to have such issues. If you have a Mac that is older than 2011, we still recommend Crucial SSDs for both reliability and cost savings. Do check out our current range of Solid-State Drive (SSD) upgrades for your Mac.